Just like the old adage says, “Failing to plan is planning to fail”. And in as far as content curation is concerned, the same rule applies. You need a plan for your content curation activities. So in this post, we’ll be sharing with you 5 ways to curate content as part of your content marketing strategy. Using social signals can be a powerful indicator as to what interests your audience or what keeps them engaged. Check out your competitors’ social media accounts and analyze the “conversation” that’s going on between their business and their customers – their fans, followers, etc. Keep in mind that customer feedback is gold. See from their activities if they have some unanswered issues on their timeline – those can be blog post ideas for you! Have a hard look as well at the analytics for your social media accounts like Facebook and Twitter. See what questions are frequently asked. And if customers have some requests – like a feature or new service, thinks about it. Perhaps a blog post will be a great idea to answer those questions and requests. Yes, you read it right – your inbox! Chances are you are subscribed to newsletters from different blogs which you found interesting. And whenever a new post is published on these sites, you are in the front seat. Have a read through your inbox, schedule a few minutes of your time each day or week for this. You will never know how much information is in your inbox right now unless you have a look, right! Again, you need not look very far. Look at your blog posts and check which ones gained the most social shares and had a fair amount of comments. If these posts belong to the same category, create something like: “The Best of ….”, or make them into a Powerpoint which you can then turn into a Slideshare presentation. Then if that Slideshare presentation becomes a hit, turn it into an infographic or possibly a video. Remember, the possibilities are endless! You may use Google Alerts and set it up so that you receive email alerts based on your keywords. Rich Site Summary (or Really Simple Syndication) readers are tools that can help you create a feed from various sites, blogs and online magazines. 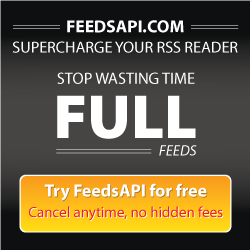 FeedsAPI Full Text RSS Feed is one feed reader that allows you to read the full text of article without having to leave your feed and actually go to the site where the article was published. Thus, you’re able to curate content faster without having to move from one site to another.